The 2014-2015 Outstanding Undergraduate Scholars were celebrated with a reception and awards ceremony April 16. Imaging Science student Elizabeth Bondi can be seen in the front row, third from left. Rochester Institute of Technology honored 104 students whose academic and personal achievements have made them this year’s Outstanding Undergraduate Scholars. The awards, a bronze medallion, were given in ceremonies on Thursday evening to those students who have met the scholarship criteria—a minimum grade-point average of 3.85 out of 4.0; completion of more than two-thirds of the credit hours required for a bachelor’s degree; and demonstrated community engagement, such as creative work, serve on student committees, civic activities, employment or independent research. 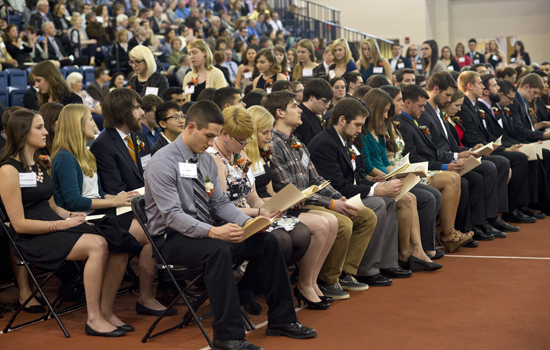 “RIT is pleased to pay tribute to these undergraduates whose demonstrated devotion to excellence is an inspiration to the university community,” said Jeremy Haefner, RIT provost and senior vice president of Academic Affairs, who presented the scholars to President Bill Destler and RIT deans at the ceremony in Gordon Field House. Recipients include third-year Imaging Science student Elizabeth Bondi. George Dederich, of Syracuse, N.Y.
, of Kennedy Township, Pa.
Cody Farr, of Holland Patent, N.Y.
Nicholas Flumerfeldt, of Corfu, N.Y.
Timothy Halsch, of West Hills, Calif.
Shaun Henry, of Willow Grove, Pa.
Michael Hund, of East Stroudsberg, Pa.
Jason Jenkins, of Catskill, N.Y.
Elizabeth Knight, of Baldwinsville, N.Y.
James Lee, of Jackson, N.J.
Nicole Seymour, of Madera, Calif.
Gabrielle Villar, of Boston, N.Y.
Kayla Weiss, of Middlebury, Vt.
Kathryn Davis, of Palmer, Mass. Michael Hayes, of Hamburg, N.Y.
Shayla Sanders, of Rochester, N.Y.
Lori Sze, of Clifton Park, N.Y.
, of Grove City, Pa.
Bryan Harmat, of Worcester, Mass. Melody Kelly, of Tamaqua, Pa.
Brett Morris, of Farmington, Conn.
Kyle Murbach, of Wheaton, Ill.
Kenneth Reuter, of Spencer, N.Y.
Wesley Rockholz, of Brookfield, Conn.
, of Rockville Centre, N.Y.
Darren Urmey, of Gibbstown, N.J.
Christopher Wong, of Clifton Park, N.Y.
Jackson Anderson, of Churchville, N.Y.
, of Tribes Hill, N.Y.
Amanda Cook, of Royal Palm Beach, Fla.
Seth Gottlieb, of Bethesda, Md. Andrew Greeley, of Gerry, N.Y.
Brenden Hoff, of Plymouth, N.H.
Kathryn King, of Orchard Park, N.Y.
Carolyn Krasniak, of Owego, N.Y.
Jonathan Lunt, of Hanover, N.H.
Alicia Piscitelli, of Lansdale, Pa.
Christopher Schwab, of Holliston, Mass. James Thesing, of Moorhead, Minn.
Amy Zeller, of Marion, N.Y.
Trinity Barnosky, of Rochester, N.Y.
Kyle Burke, of Chelmsford, Mass. Patrick McMullan, of Easton, Pa.
Natalie Snyder, of Rockville, Md. Sylvie Alusitz, of Yorktown, N.Y.
Emily Barresi, of Greenwich, Conn.
Brittany Bateman, of Virginia Beach, Va.
Avanell Brock, of North Kingstown, R.I.
Samantha Chalut, of Fenton, Mich.
Olivia Cookfair, of Brookfield, Conn.
Philip Czapla, of East Aurora, N.Y.
Emily DeVault, of Fairmont, W.Va.
Sarah Ann Jump, of Easton, Md. Alexa Martinez, of Wall, N.J.
Jamie Martinez, of Wall, N.J.
Britta Moberg, of Greenfield Center, N.Y.
Elizabeth Pieri, of Syracuse, N.Y.
Jessica Schnall, of Webster, N.Y.
Danielle Smith, of Burke, Va.
Matthew Tidridge, of Milford, Pa.
Hayden Wagner, of Lodi, N.Y.
Lucas Dorsey, of Cazenovia, N.Y.
Brandon Dziedzic, of Buffalo, N.Y.
Alyssa Jackson, of Naples, N.Y.
Tianna Mañón, of Rochester, N.Y.
Courtney Ullger, of Lake Grove, N.Y.
Linda Cunningham, of Rush, N.Y.
Nathan Scott, of Colonie, N.Y.
Rachel Green, of Springfield, Mass. Catherine Lambe, of Marcy N.Y.
Jordan Armeli, of Falconer, N.Y.
Taylor Barrett, of Middletown, Pa.
Elizabeth Bondi, of Dansville, N.Y.
Will Consagra, of Brockport, N.Y.
Alexander Triassi, of Henrietta, NY.